Training your baby on how to walk involves them learning to move their legs confidently by balancing themselves in an upright position. 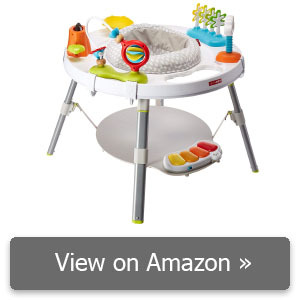 A baby activity center will teach your infant how to do so quickly since their walk is slightly suspended. Toys are accompanied on the table to keep them busy as leg movement becomes second nature. 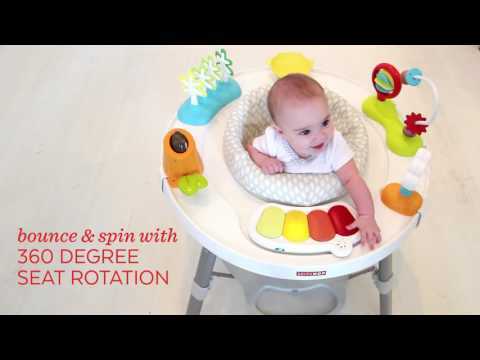 What is the Best Baby Activity Center in 2019? 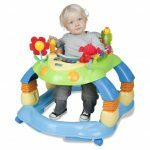 Below are seven of the Best Baby Activity Center sold online, designed to assist your infant or young toddler in mastering the basic fundamentals of controlling their posture, all while having fun doing it. 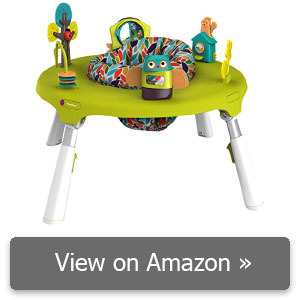 The Fisher-Price Rainforest Jumperoo is has a circular-shaped button and grey frame that circles around the activity center. There are loads of toys for your child to keep them busy. The seat is shaped like a red frog with cushioning high enough for short or taller infants to feel comfortable inside the sitter. The leg supports are very strong and non-abrasive, meaning they won’t wear down overtime and expose your baby to any cutting hazards. As you place your baby into the seat, you’ll notice the wide bottom below, which further lowers strain on the legs and back. This is important for your child as some sitters are refused by children simply from being too uncomfortable. Yet there is room for improvement. As your baby plays with the toys, they will become loosened quickly, particularly the birds and figurines directly below it. And attempting to fold this will be pointless unless the room it’s in has double doors for an exit. You’ll likely have to take apart the entire center before moving to another location, especially if your house or apartment is small. 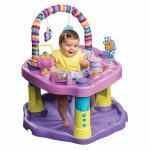 Overall, the Fisher-Price Jumperoo is recommended for any baby and makes an ideal product for parents who want something that’s safe yet includes enough activities to keep them entertained. Assembly is very easy and should be finished within five minutes. 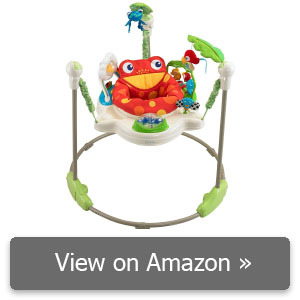 Fisher-Price Rainforest Jumperoo Review: He Loves it!!!!!!!!! The 3-in-1 Around We Go Activity Center is very colorful, an attribute that seems to be missing on many activity centers made recently. 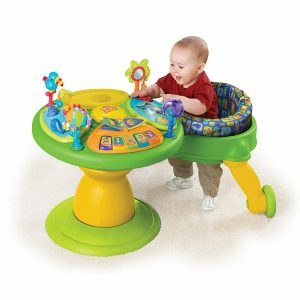 There are buttons that play different sounds and interactive toys on all parts of the table, some of them great for teething. The table is separate from the walker, it resembles a motorcycle sidecar. The table is attached and circles around the sitter, which has two legs outfitted with wheels. Your baby can practice walking with this feature, or bouncing in a single position while they learn to keep themselves in an upright stance. Once they’ve outgrown the walker, just take it off and the table doubles it’s lifetime by converting into a separate play area. One of the best ideas presented with this is how other children can also play with the toys that are within reach on a separate walker. A downside is how far the attached walker is to the toys. For any item that’s on the opposite side of the table, your child will probably not be able to reach it. While they could go on the other side using the wheels, this won’t be possible if walking is still being learned (but could encourage walking). If placed above a carpeted floor, the friction could inhibit rolling. As such, this activity center is best on hard floors and carpets without loose strands on the ends. Consider the We Go Activity Center if you have multiple children since the odd placement leaves room for a second child to join in on the fun. There’s even a small tray area for them to place more toys, so it certainly will please them for a long time after they’ve learned to walk. When you’re outside, at the park, or on the beach, holding your baby may tire you out quickly and leave little room for you to attend them without being in your arms. The Summer Infant Pop N’ Jump aims to solve this problem by being a beach chair for babies and toddlers. There’s a mat under where their feet will go, so you won’t have any concerns for small critters such as spiders or mosquitoes getting close to their legs. On top there’s a canopy, wide enough to cover most areas of the directly below with shade. It curves like an arch on each side, shielding your child from wind gusts as well. A mesh portion is near the tips to keep their (and your) sight in range. And the fold is neat and quick, just bend the center of the legs and pull up; the activity center will fold vertically and fit in most small spaces with at least a typical folding chairs worth of space available. However, some critique is needed. It’s a high probability that you will end up bringing additional toys with you for your child to play with, as what’s featured on the table is drab and, depending on the baby, possibly boring. There’s also the chance of causing damage to the device since a slight brush by someone’s shoe could move the product and any kid that’s placed inside. And if you like to feed your baby when in the activity center, you will end up washing this quite frequently since the fabric material is easily stained. Overall, a great outdoor product for babies and parents that love being outside and need something to keep their infant secured in a safe place. 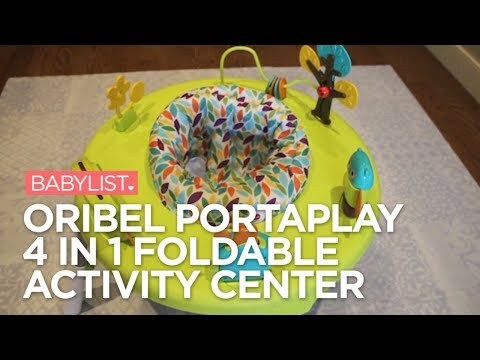 Today, more toys are being produced that can last much longer than the age ranges of an infant and toddler, the Oribel PortaPlay Travel Center obviously had this in mind when designing their table. For starters, The seat has a very soft cushion at the center that’s wide, helping a baby to stabilize themselves without trying too hard, reducing the likelihood of crying from being in a posture they’re not accustomed to. When it’s time to put it away, you can pull the green latches and the legs will fold into themselves, going into a hollow area at the bottom of the table. The dimensions at this size are small enough to fit under a bed, between narrow items in a closet that’s already full, and behind furniture appliances. The toys are also well designed. Oribel made sure to consider shorter babies, as the play items are all within arm’s length of infants and perfectly safe in build, having no small or sharp parts that could lead to injury. With this being said, your baby won’t be able to bounce themselves in the chair very well and there are no sounds, musical instruments, or lights to keep them distracted. It’s likely that they will become distracted by something outside of the activity center if there are already many toys for them to play with. Regardless, the PortaPlay Travel Activity Center may become used at a later time since the center has the option of being switched to convert as a real table. As they later grow into a toddler, they can use the tray to practice writing, drawing, or play with other toys on. Without a doubt, there’s plenty of versatility with this product. 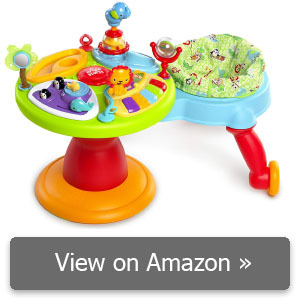 The Skip Hop Explore and More Activity Center was made using some innovative techniques that aren’t seen in some of its competitors’ products in the same category. The white tabletop is brightened with lots of great looking toys. The whole product looks good as a centerpiece to any baby’s playroom or bedroom and is easy to clean and assemble when taken out of the box. Your baby is suspended from the sitter, their feet stopping to rest on a board underneath that has keyboards in the front. A small opening on top allows them to view the buttons, so they can press their feet on them to make a sound. This is a great way for your infant to pick up on early gross motor skills, hand-eye coordination, or to just get them tired enough for rest. There is some information that you should know about before you buy. The owl toy that’s inside the tree pops up and can go back down inside when a child presses it in. If they do so with their finger, they risk getting their finger stuck inside. You may want your baby to avoid this if their curiosity is high for such toys. The lower plate is also no good for bouncing and further restricted since no springs are featured near the sitter. 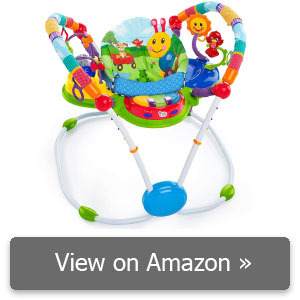 Overall, you will like this device for all the sounds it makes, particularly if your baby is only distracted by audible or moving toys. They have lots of ways to play that incorporate the use of their arms and feet, making them happy and well rested once finished. 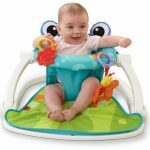 The Evenflo ExerSaucer Jump and Learn Jumper is useful to babies that are growing rapidly since the entire product can be adjusted to better meet their height. The little green pagodas are framed with a circular piece that surrounds the bottom, along with a centerboard that helps get them to an upright posture. 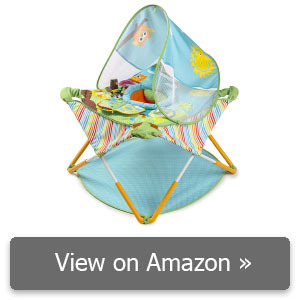 It’s very sturdy and well suited for bouncing. Disassembly will be a pain, however, you must take it apart again to move it in a different room with a narrow doorway. And get ready to use many batteries to keep the lights and sounds work. It takes six AAA batteries and they tend to drain at a rapid pace. And one toy, in particular could pose a bruising hazard. Be sure to inspect every toy and keep them attended to while playing, avoiding any bouncing if anything is near their mouth. In the end, the activity center will surely be a treat with all the sounds and sights for them to focus their time on. The last product featured is the Neighborhood Friends Activity Jumper. The level of interactive play with this item is uniquely themed, changing as they rotate to discover new toys and colors. There’re also things to play with from above, situated on the upper framework of the product. Hooks in the same area can also attach to separately acquired toys. No matter if your floor is carpeted or hard, the bottom won’t shift around or come apart easily. There are no wheels, so the only motion they’re capable of is bouncing and rotating. If you want a sitter that keeps your baby stationary but without the ability to walk with it, this activity center will suffice. On occasion, the swivel that rotates the seat may stop, making the child’s movement impossible until fixed. To do so, you may have to move them from the sitter and align it back to continue their play. Furthermore, use care when you do lift them up. There are abrasive areas around the bottom. If you move too quickly, you could scratch their feet as they brush against it. Straighten out their legs and move slowly as you pick them up from the sitting area. The Neighborhood Friends Jumper will still be a fun product for most children who want to play but not walk around. Use it help them learn numbers and the names of everyday sightings (flowers, birds, etc). You will love the way every toy seems to surround them at all angles, and their imagination that follows. Activity centers are used for many purposes other than toys. 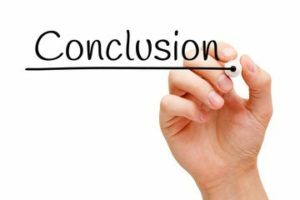 While it should be factored into your final purchasing decision, there’s more you should know about before you narrow down your search on a particular item just yet. Safety is without question the more important thing regarding any children’s toy. Yet it can get a little tricky, too. What’s safe for one baby/toddler may not be okay for another. As the same time, there’s little room for taking any risks. If you think your child would risk hurting themselves from a certain toy or section on an activity center, look for another product that doesn’t raise concern. Some activity centers will have springs in the support area of the seat that’s within the fabric and cannot be seen; they allow the baby to jump up and down slightly, helping them gain confidence in posture and walking abilities. Other brands may not offer this or simply make it too difficult for them to undertake. Usually, those with boards at the bottom are not recommended for a kid that loves to bounce. Even though some products might be marketed as being able to fold, others won’t confine to the dimensions needed to easily fit through doors, especially doors that are narrow and corridors with little space. As you assemble the activity center, do it in a place where you won’t need to take it out the room too often. In fact, some would need to be completely disassembled if changing rooms. You don’t want to continue this process every day, so the child’s bedroom or living room (anywhere they spend the most time when awake) could be the best option for you. Anything that’s audible or has lights with playful music will capture the attention of a child. They love to play with anything that broadens their imagination. As such, an activity center with these features will generate lots of noise, so be prepared to hear sounds whenever it’s time for them to play. There’s also the need for batteries, so if you’re on a budget, you may want to avoid getting one that requires them. You don’t want to have your child grow accustomed to the music and suddenly have it stop working. Thankfully, there’s still lots of great activity centers with no music at all. These will often feature more room for additional toys, so if your baby already has many figures that make noises, you could look for something that allows the product to attach to the table. When you’re ready to pick the activity center you want the most, consider the information laid out in the guidelines. Then, if necessary, view the positive attributes and not-so-great aspects of the product you have in mind. Doing so will ensure you’ll end up with something that your baby will enjoy throughout their young lives. 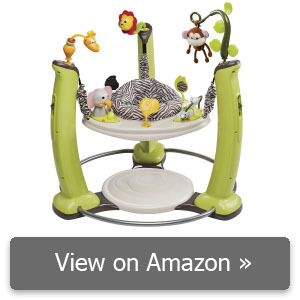 That said, there was one product, Fisher-Price Rainforest Jumperoo that stood out above all the others we reviewed as the Editor’s Choice Best Baby Activity Center. And, as a reward, happiness from seeing your child use tools that can develop their first steps at learning will be beyond gratifying. 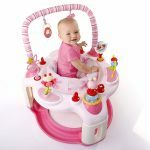 But if you are looking for the Best Price than Summer Infant Pop N’ Jump Portable Activity Center is for you. Comments for "Best Baby Activity Center"